Whether you love the idea of a Christmas-inspired wedding in spring, or want your holidays to be very merry with the added bonus of a wedding at the time, Christmas weddings are a delightful idea. 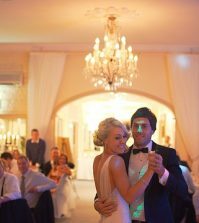 Steeped in tradition, with so many festive elements, there are a few ideas we can borrow from Christmas and rock at your wedding. With Santa’s visit scheduled in just a few days, this is the best time to take a look at how you can plan a fantastic Christmas wedding! So, bring on the holiday cheer and get ready to be inspired. Let the tables at your wedding be elaborate masterpieces of red, gold, silver and white. Be generous with candles and throw in the seasonal signatures like fir, pine cones and holly. We love the idea of adding cute mini Santa hats and stockings with a scattering of snow for authenticity. Consider mixing in striped straws in red and white, cupcake cases that match the theme. 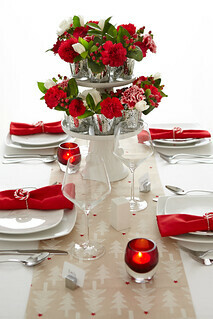 Let the table linen be in red with white or gold accents. Or if you have a colorful centerpiece, opt for stark white table linen, instead. 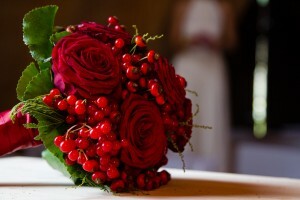 The logical choice would be to choose a bouquet of red roses and have more of them throughout the décor. However, if you don’t want to limit yourself to reds and greens, you may like to consider colors like plum, purple and berry colors. A bouquet with berries alongside flowers would look fantastic, and perfectly Christmas-y! Add lavish doses of green into your floral décor and bouquets, and it will look more refreshing. A flower crown would be festive and interesting. 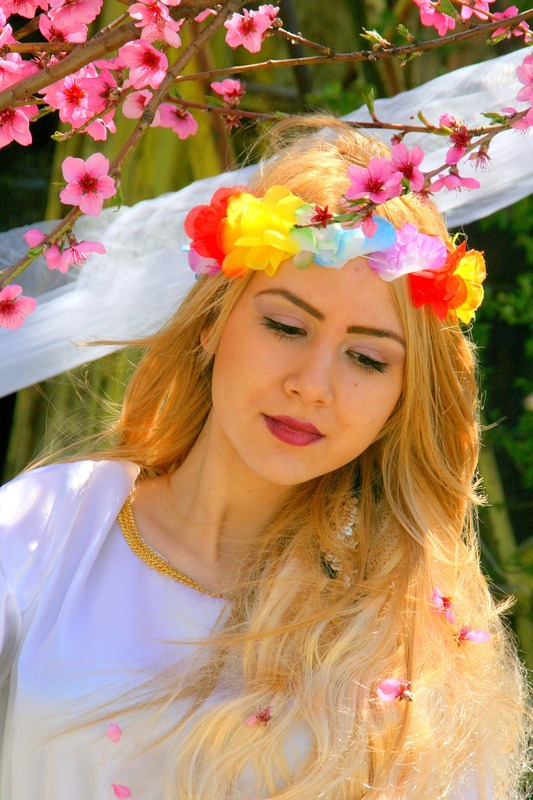 Or you could add tiny roses into your hairdo, and match the festive atmosphere with bright gold accessories. Add colors like berry or scarlet red into your makeup, or through your accessories to make sure you match the theme that’s going on. Skip the French manicure and do your nails in bright red. You could also consider a contrast waistband or deep red shoes for a pop of color. Choose a wedding dress that is snowy and exudes the holiday feel. Dresses with layers of misty tulle or with frothy ruffles would help you nail it. The other option is to dress yourself up in a vintage lace gown, complete with full sleeves and a high collar. Experiment with reds, purples, green, silver and gold for your bridesmaids dresses. Marsala, which is the color of the year, would also be a great choice. If your wedding is in the winter, make sure you choose long gowns or find warm footwear, so your girls feel cozy. For dark dress shades, do the bouquets in white for a welcome contrast. Make your pick from the best bridesmaids dresses and wedding dresses for your holiday wedding from our collection at Best for Bride. Merry Christmas and Happy Shopping! I wouldn’t want to plan a wedding for this time. There is already so much stress involved in the holidays, it would be double for me. The more I see the Sophia Tolli dresses the more I really want to get fitted into one. They are elegant! Such a great choice! Go for it! This is a great post. I think if you are planning a wedding around the busiest time of the year for most people, you might be in for a surprise.